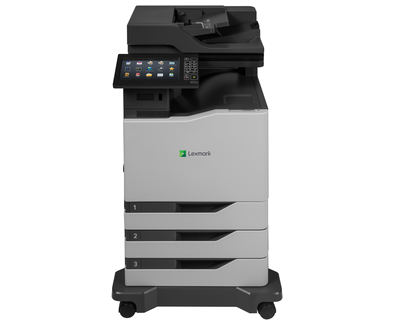 The Lexmark CX825dte colour A4 MFP combines print speed of up to 52 pages per minute, ease of use, professional colour and standard input capacity of up to 1,750 pages with available finishing options. It starts with standard input capacity of up to 1,750 pages (expandable to 4,500) and prints on the broadest media weight range of any A4 colour laser MFP – from tissue-thin paper to thick card stock. Later, add a compact inline staple finisher or multi-position staple/hole punch finisher.